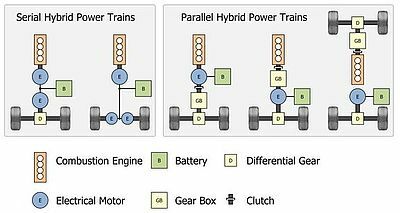 Hybrid electric drive trains combine at least two different kinds of energy converters. Usually a combustion engine (chemical to mechanical converter) is complemented by an electric motor (electric to mechanic converter).Benefits of hybrid electric drives are a better fuel efficiency and reduced emissions compared to conventional drives. The focus is primarily on the reduction of fuel use, as there are political requirements as e.g. the Global Warming Bill, California, USA, 2002. The favored reductions of consumption and emissions are feasible with hybrid electric drive trains; still they are quite small. In order to exploit the available economization potential, optimization of the whole drive train structure as well as of separate components and of the control strategy of the hybrid electric vehicle is required. Knoke, T.; Romaus, C. & Boecker, J.
 Knoke, T.; Romaus, C., Böcker, J., DellAere, A., Witting, K.
 Knoke, T.; Schneider, T., Böcker, J.
 Böcker, J.; Huber, T.; Romaus, C., Specht, A.
 Böcker, J.; Huber, T.; Romaus, C.; Specht, A., Wallscheid, O.